No. 6 of 8 painted in an ongoing series of approximatly 40 works. A year ago I began a series of works which celebrate life and work on our inland waterways. 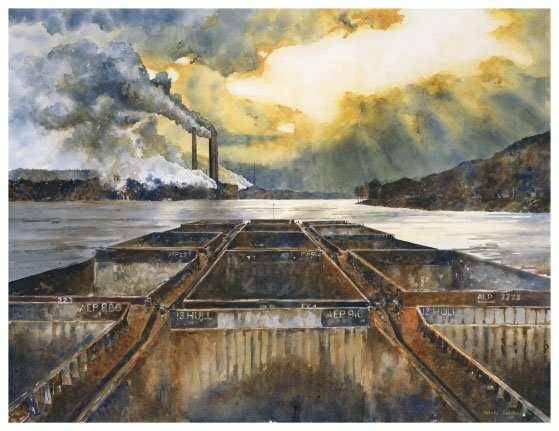 Last fall I rode a towboat for a few days pushing fifteen coal barges on the Ohio River. Last Light and a number of others in the series resulted from that trip. More recently I made two trips to the lower Mississippi visiting shipyards and other sites of river activity and industry, riding work boats and, as is the case of the above painting, boarding vessels in mid-stream being loaded or unloaded. My intention is to paint approximately 40 works portraying river work and life on all of our major waterways. A month ago, I also became an ‘official’ Coast Guard artist, a position that I am honored to hold and that allows me access to Coast Guard vessels and activities anywhere they are active – Alaska, Antartica and Kuwait included. I have made three trips to date with the Guard, two on the Mississippi and one on the Missouri. I plan on riding with them in September/October in Mobile Bay, the inland waterway system and the Gulf (out of Mobile) and on the Cooper River and inland waterway system (out of Charleston). I will be painting my first Coast Guard work later this fall. The Coast Guard has placed my artistic ‘bio’ on its website along with a link to my website. I continually look for opportunities to capture subject material for future works and hope to get out on the Tennessee and Illinois Rivers sometime next year. In the meantime I continue to add works to the series. No. 8 of 8 painted in an ongoing series of approximately 40 works.